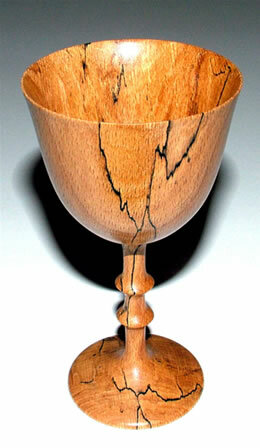 A Spalted Beech goblet made as a New Year present for a very close relative. 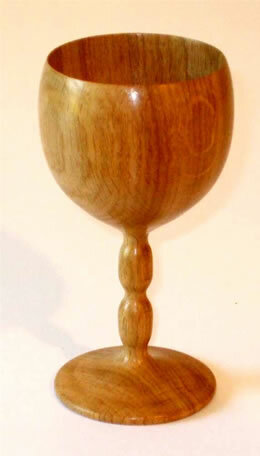 This Oak goblet was made for my daughter as a birthday present. 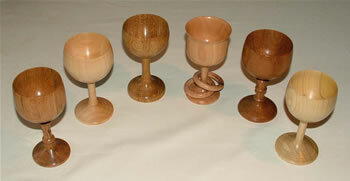 On the left a glued up blank consisting of 2 pieces of Padauk, turned into an elegant goblet 115mm tall. 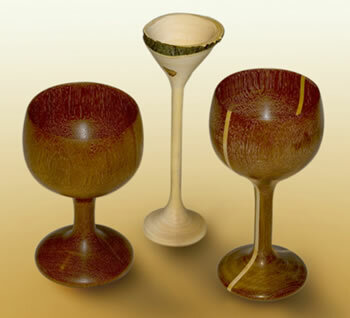 In the centre, a tall thin goblet (150mm) made of apple. On the right, a 3 piece glue-up using Padauk and Basswood, 140mm tall. For many years now, my wife has been in close contact with a group of 9 other ladies, all of the same age. The 10 'girls' were at 'Fentham Girls School' together in Birmingham until about 1965, at which time, they split up and went their various ways, as you do. The year in which they were all 50 was a pivotal point, as they all started to get together again, and since 1997, many close bonds have been (re-)forged. As a direct result, the 10 girls and 6 husbands / partners now meet up at least once a year in early September for a very pleasant weekend dedicated to good conversation, pleasure, food, and drink. The annual meeting takes place in various parts of the country, i.e., Birmingham, Newport (Gwent), Poole, Stratford-upon-avon to name but a few. This year (2008) the event is taking place in Brighton, and as a gesture of friendship, I decided to make each girl a goblet. For me, it would be a valuable piece of training, and for the girls, it would (I hope) be an interesting gift to mark the weekend. The first stage of the project was to place a call to those excellent people at Stiles & Bates. The order was simple, I wanted a dozen wood blanks, each 3" square and 6" long. The next bit was the challenge (I thought), in that the 12 blanks were all to be english timber, and different. Fortunately, it was no challenge to Stiles & Bates. The order was completed by telephone on a Saturday afternoon, and delivered first post the next Tuesday morning, typical of the first rate service you come to expect from them. The next phase of the project was spread over a few weeks as the goblet collection grew. 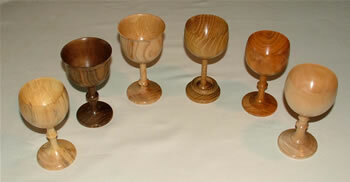 The aim was to make 12 goblets, all of differing design from the 12 blanks. This would then allow me to choose the best 10 to give to the girls as a present in September. The final results of my efforts can be seen in the photo's that accompany this text. The photo at the top shows goblets made of Beech, Sycamore, Oak, Apple, Elm and English Tulip, and the photo at the bottom, Sweet Chestnut, Walnut, Ash, Acacia, Cherry and Maple. A closer view of each goblet can be seen on the animated photo in the middle. I am very pleased with this group of goblets, and if I look at them in detail, I can see improvements in quality between the first and the last. After all, that was the main point of the exercise for me.